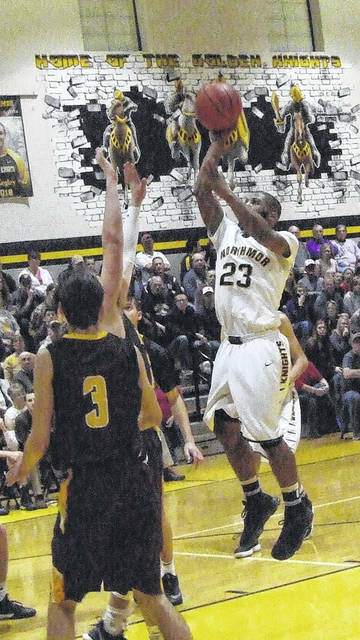 Tyler Kegley tallied 22 points to lead Northmor past West Jefferson on Saturday. Demetrius Johnson works his way into the lane for a basket in his team’s Saturday tournament win. 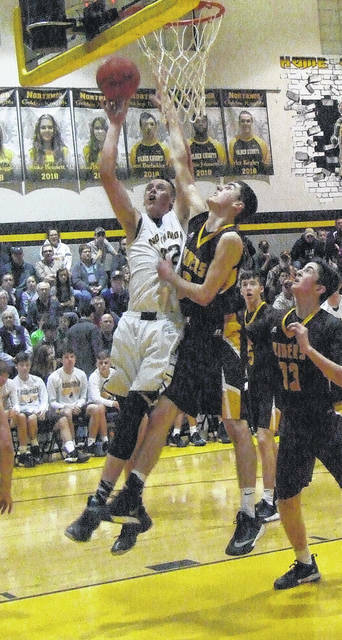 A huge first half by Tyler Kegley staked Northmor to a 21-9 lead at the half against visiting West Jefferson Saturday in a Division III sectional contest and the Knights would go on to handle their opponents by a 53-35 margin. Kegley, who finished with a game-high 22 points, tallied 13 of that total in the first half, including tallying 10 straight Knight points at one point. Kegley made his impact felt early. After a shot by Demetrius Johnson narrowed a 4-1 deficit to a one-point margin, he scored six straight points to give his team a 9-4 lead. After West Jefferson scored to close the period, he tallied the first four points of the second quarter to put the Knights up 19-6. Brock Pletcher and Kyle Kegley then hit back-to-back three-pointers. While the Roughriders connected with their own three-pointer, Tyler Kegley was able to finish the half with a basket to allow Northmor to take a 12-point lead into the break. Ruth was very pleased with his team’s defense on the night, noting that they were able to take WJ out of their offensive game plan. Playing a big role in his team’s strong play was a loud crowd, something that the coach appreciated. “We’re playing for them, we’re playing for ourselves and we’re playing for this community,” said Ruth. In the third quarter, West Jefferson made run after run at the Knights, but Northmor was able to hold them off and maintain their double-digit lead. The Roughriders scored the first five points of the third to close within seven, but Northmor got a three-pointer by Pletcher, two baskets from Tyler Kegley and a steal and score by Kyle Kegley to jump out to a 30-14 lead. A 10-4 run by WJ got them back within 10, but Tyler Kegley finished the quarter with two more points to keep the Knight lead at 12. Northmor would put the finishing touches on their win with a strong fourth period. Kyle Kegley opened the quarter with a tip-in. After two West Jefferson free throws, Johnson hit two shots from the charity stripe and Kyle Kegley followed with four points. The Roughriders responded with a three-pointer, but Northmor was able to get a nifty pass from Tyler Kegley to Kyle for a dunk that made the score 46-29 with 3:52 to play. The Knights would lead by as many as 19 down the stretch before finishing on top by 18 and moving on to play the second-seeded Africentric team Tuesday at Westerville North. Ruth noted that the Nubians, who feature the Central District Division III Player of the Year in senior Tre’ Baumgardner, as well as second-team pick Jah Bennett, a 6’8” post, will be a tough team to go up against, but noted that one could say the same thing about his Knight squad. Tyler Kegley led the Knights with his 22-point night, while Kyle Kegley added 12, Johnson scored 10 and Pletcher finished with eight.